Cost optimization can effectively be contributed to by rightsizing your IT-environment. The preparation for migration of resources provides an excellent opportunity to assess possibilities for phasing out unused elements, and saving budget on operations and licenses. This precise situation was successfully handled by a customer of ours, using vScope to investigate database usage and identifying unused resources, leading to lowered costs in both migration and future operations. 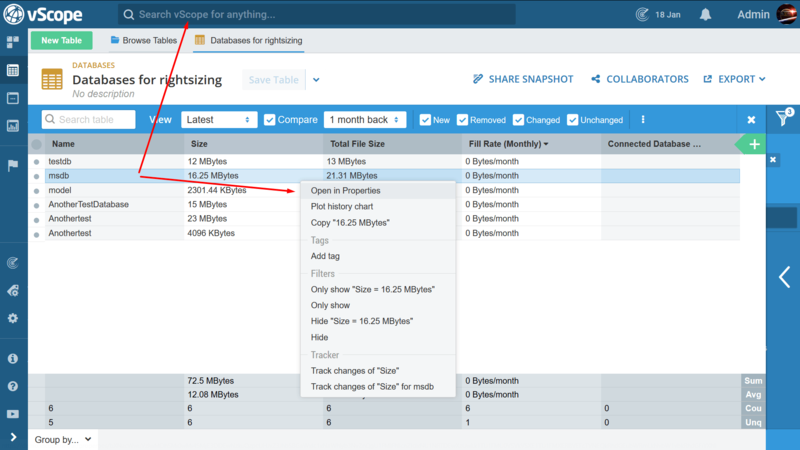 The customer at hand, on which this tutorial has been based on, received a number of alternatives to estimate database usage with the help of vScope Database. Instead of wasting time on gathering information by manually inventorying databases, and holding hour long inefficient meetings with no proper documentation; the case company benefited from vScope’s collection and automatic analysis of their data. In addition, on top of a reduction of resource waste, the outcome of the rightsizing process landed the customer with easy to access and dynamically updated documentation of their database environment. However ironic the phrasing, migration is a constant in IT. And when preparing for such change, a core question to ask is not only how to migrate, but what to migrate. 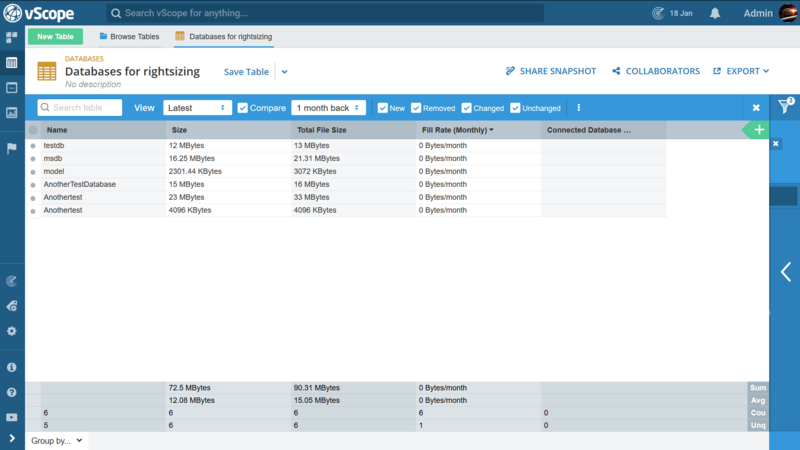 Rightsizing is an important part of any migration project and a key to cost optimization. Knowing your needs before buying more resources and storage should be an obvious start, but it often proves to be a challenge. In the specific case described in this post, a customer with a large number of Microsoft SQL Servers had an immediate need to identify unused databases. Used databases were to be migrated to a new and updated server platform. In the current state, the case company’s IT documentation lacked sufficient information about usage, ownership and relations. To simply contact system owners and ask for the necessary decisions was not possible. The client this case was based on is a medium sized Swedish municipality with a centralized IT governance. The IT-organization took an interest in vScope due to large upcoming change and optimization projects, as well as due to a general wish to keep better track of infrastructure. In order to view history your vScope must have been running for a while (at least one month for monthly predictions). The screenshots in this tutorial are from a vScope with all products licensed. 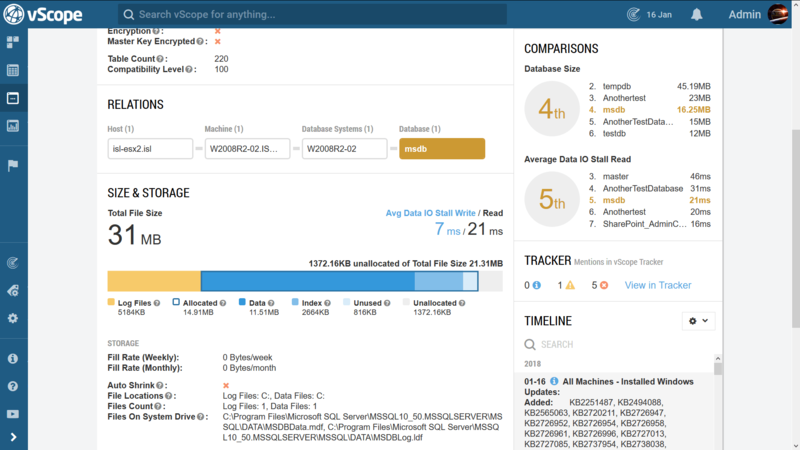 While uncomplicated to work with, vScope can enable advanced analysis of resource usage in your environment. This can be done from a number of different perspectives, but this time we will mainly be focusing on what we can do with vScope’s Database product. In the next two sections, you will be shown how to use Table explorer and Properties to measure usage and track activity in your databases. Our goal is to identify unused resources so that these can be further investigated and possibly discontinued before the migration. Always check your vScope’s Tailored recommendations section before advancing into constructing your own tables. You will find a large collection of interesting built-in documentation and reports here, customized to the findings vScope has made in your environment and to your own interests. TIP#2 Try configuring your personal Interest-settings. It will help vScope present you with the most relevant data. Your personal settings are found under your user profile. Tailored recommendations are located under Table explorer -> Browse tables. 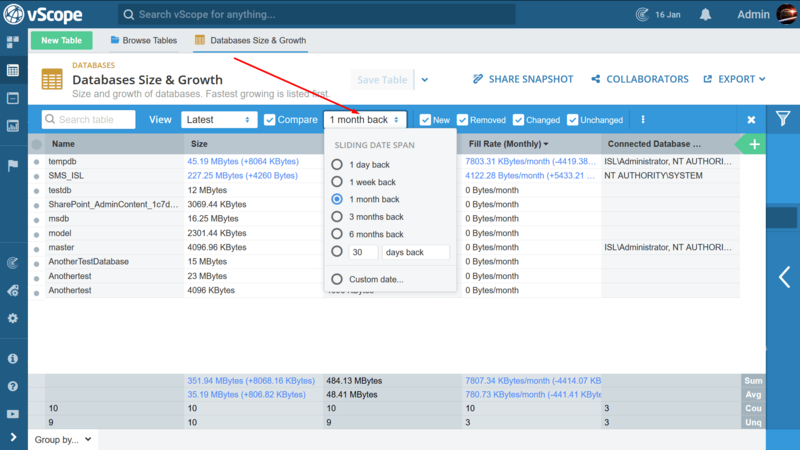 For a basic overview of database usage, try the Database Size & Growth table. The Database Size & Growth table will by default give you a view of monthly fill rate. 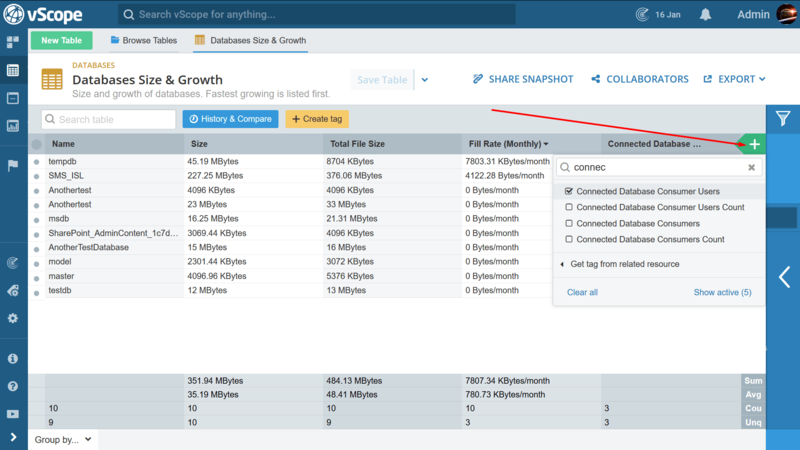 This requires a history of 30 days for the tag to be populated with data, but you can add both daily and weekly growth columns by opening those tags from the green Column Selector. Any cell values with 0 fill rate? These are the databases we are looking for since it seems as if not much is happening here! They could possibly be left out of migration. Additionally, try adding the tag Connected Database Consumers Count. This will show if there are any machines that are connected to the database. We can’t be a hundred percent sure the the databases without any connected consumers are unused databases but it will give us a hint. To improve the accuracy of this analysis we can look back in time to investigate how the number of connected consumers have changed over time. 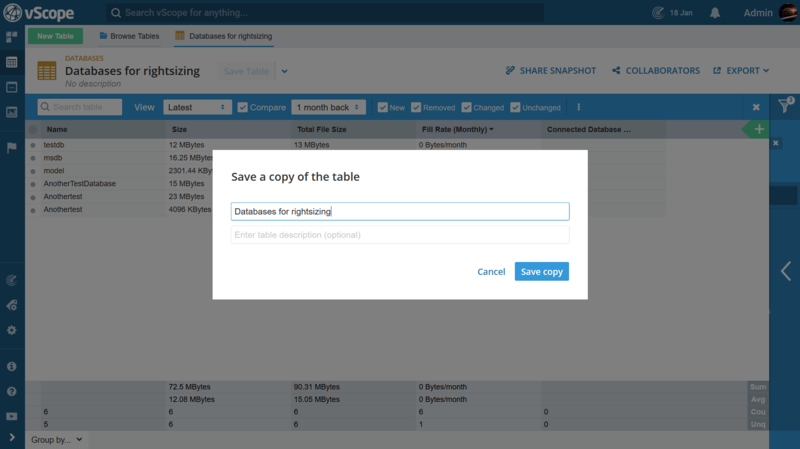 Click History & Compare, and choose an appropriate time range for tracking your database activity. Try starting with 1 month back. along with Only show Connected Database Consumers Count = empty. The resulting list will give you an idea of what resources have not been in use. Remember, this is an investigation meant to identify potentially unused databases. If you are unsure about the utilization and purpose of the listed databases, you will need to share this table to someone that is more familiar to this matter for further investigation. You can safely share your table with anyone in your organization (clicking Collaborators). Just make sure that they have a vScope account (Learn how to integrate vScope with your directory service) and access to the vScope service. 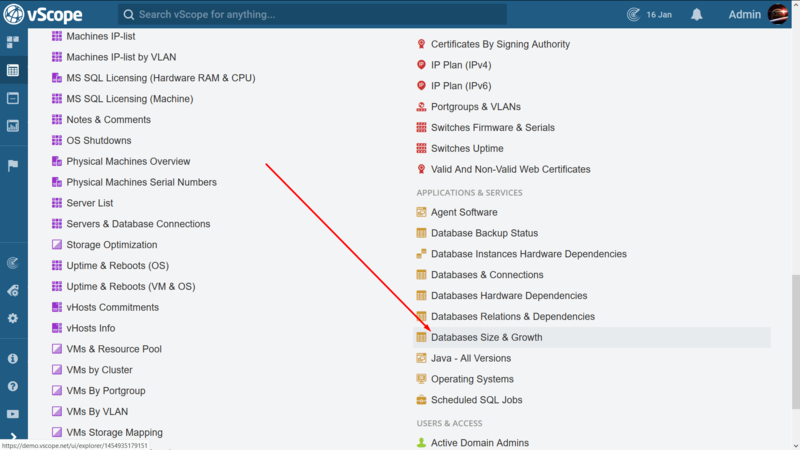 The Properties pages in vScope can be used to further track database activity. Use Omnisearch in the top bar to search for a database, or just right-click it in Table explorer and choose “Open in Properties”. Any database related resource will have a special property feature displayed, called Relations. The relations chain gives you a view of relationships all the way from Host to Sessions. Notice that the boxes are clickable and lets you “jump” between related resources and investigate connections further. Tip#3 Try hovering over a session for more information about it. While still on the Property page, have a look at the Timeline of a database, or the Size & Storage section. These will also give you hints about recent activity. 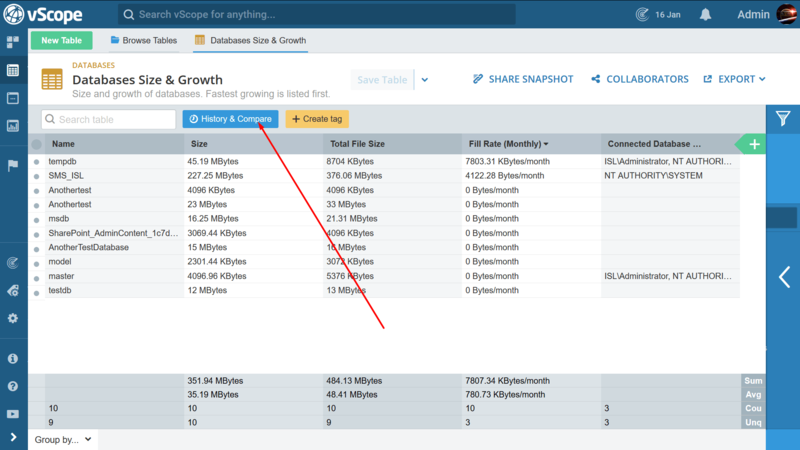 Tip#4 Click any part of the Size & Storage bar to plot a history graph. 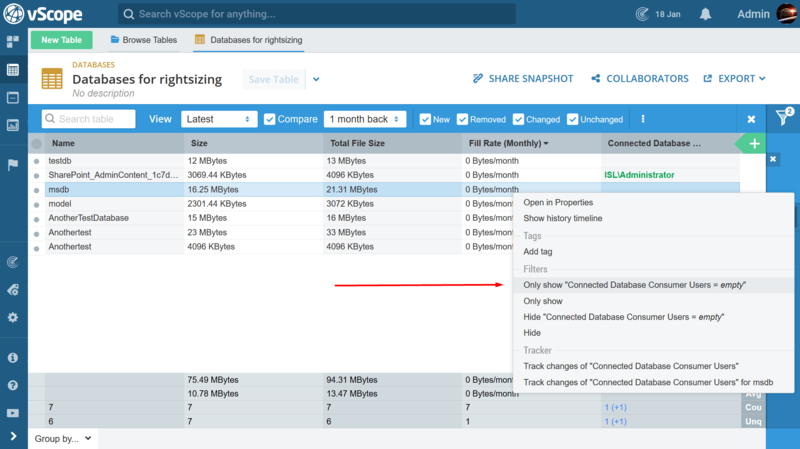 vScope does provide you with valuable insights and hard facts about your databases, but people are always the key to fully solving problems like the ones we are dealing with in this case. Knowledge and know-how are widely spread across any organization, so important background information can be held by other parties. So, using the information you just acquired as a basis, make sure to share insights and discuss action plans with system owners regarding whether or not the identified resources can be left behind in the migration process. Simply migrating to a new environment, knowing that you are only focusing on relevant resources might sound fine. But as already pointed out, change is a constant. You are already entering your next change cycle. To make sure you benefit completely from the manual work you just went through, use vScope to complement your IT-documentation. Those system owners and other relevant parties you just identified? You might want to use the Notes field under Properties to share that info with your colleagues. Or better still: Tag your databases with them! To learn more about different options for working with tags, check out our tutorial video about tags. We are happy to have helped! 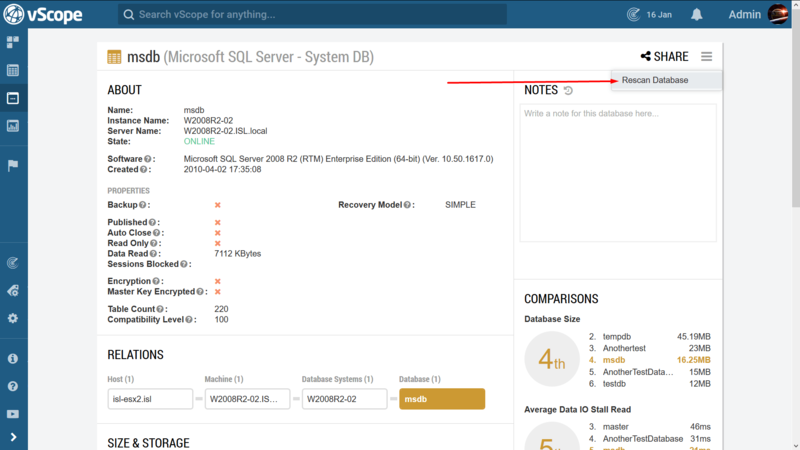 Read more about vScope Database on our product page, and give it a try yourself!